Celebrate early Texas with this large First Republic of Texas Flag Framed for your office or home decor, part of our framed Texas flags collection from our Texas history art section. Five delegates from the first Republic of Texas constitutional convention in 1836, (all signers of the Texas Declaration of Independence) chose this flag design by Lorenzo de Zavala. De Zavala himself was a Republic of Texas delegate and statesman. Born in Mexico, he served as Mexico’s Secretary of the Treasury and Minister to Paris before aligning himself with the Texas cause. This first flag of the Republic may have been inspired by Colonel Fannin who requested, "give us a flag to fight under as unlike theirs as possible…in time to hoist it in defiance to Santa Anna." This first Republic of Texas flag is handmade of cotton flag material. The flag is then hand stretched on a flag frame and comes in a rustic light barnwood frame made in Texas or our custom dark stained finish barnwood frame. 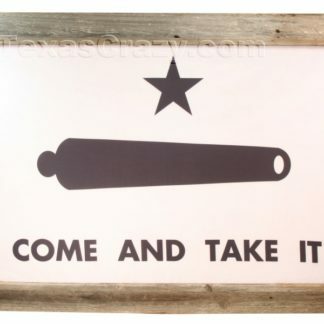 This first Republic of Texas flag comes in your choice of two sizes, a large 24 x 36 inches (28 x 38 inch frame) or an oversize 3 foot by 5 foot flag set in a 37 x 61 inch barnwood frame.